PKP IC is in trouble – in 2010 the company posted a 150 million PLN loss, it has insufficient funds to maintain its fleet of coaches, its trains are dirty and overcrowded, the air-conditioned road coaches of Polski Bus pose a serious threat. What should the company do in such circumstances? Sweat the assets? Cut down on corporate jollies? Ramp up customer service? Make the bosses travel around Poland in their own trains? What does PKP IC actually plan to do? Build itself a prestigious new multi-million PLN HQ next to Warszawa Wschodnia! Click the first link below and post the URL of the article into Google Translate for an interesting article on Infokolei about the HQs of the PKP subsidiaries. 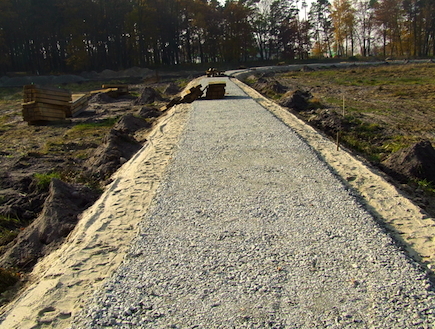 Progress on the new tram line to Bydgoszcz Station. Official video. After more than 20 years, work is in progress to enable trams to return to Bydgoszcz Station. 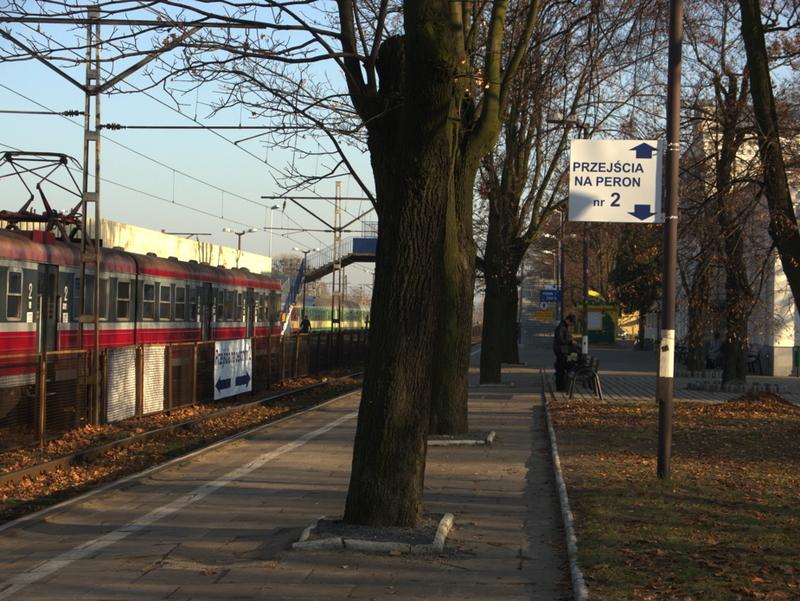 The original tram line, running mostly along ul Dworcowa, was closed in 1990. The reason being given at the time was fear that the vibrations of the trams would damage a gas mains. On this basis, most of Poland’s remaining on-street tramlines should be candidates for closure! The new tram line, will run mostly on reserved track and includes a new bridge over the River Brda. The project, including related road improvements will cost 100 million PLN with some 42.5 million coming from EU funds. The new service is targeted to open in November 2012. A hat tip to Podroznik for the link. The day begins. Koszalin engine shed, 26.11.2011. Photo Ed Beale. 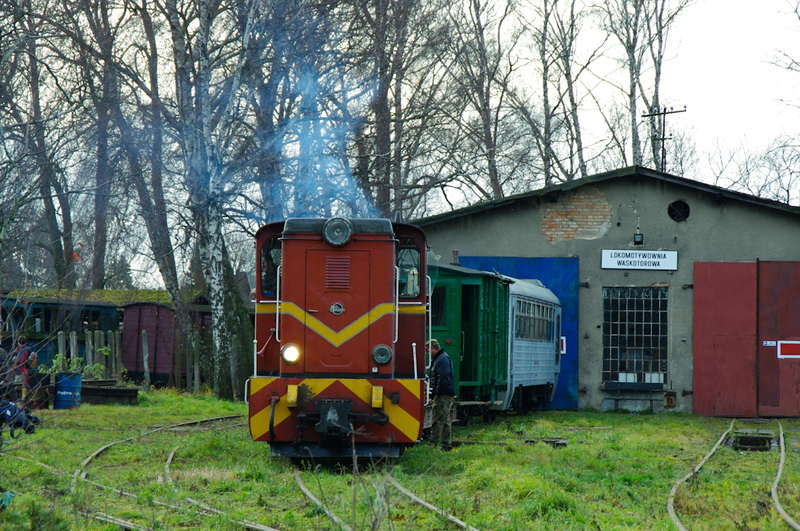 A notice on the Towarzystwo Milosnikow Koszalinskiej Waskotorowki’s (TMKW’s) Facebook site invited people to ride on a special train on the occasion of the 113th anniversary of the opening of the Koszalin Narrow Gauge railway. Departure was advised as 11:00 on Saturday 26 November. Pre-booking and pre-payment into a Polish bank account was advised as mandatory. For people without a Polish bank account, payment into a Polish bank account can be very expensive, but with the help of Dyspozytor a work-around was found. Champagne and TV at Koszalin station. Photo Ed Beale. The day went well. There were about 40 participants, and the weather was fairly kind with some sunshine and no rain. 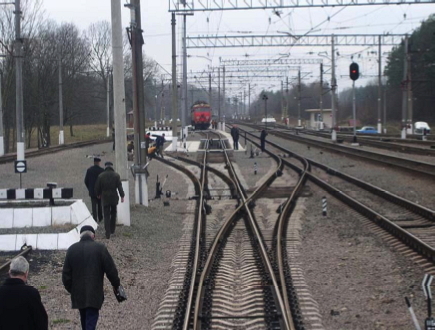 A TVP Televizja Polska reporter and cameraman were filming at Koszalin, where there was a speech, a 113th birthday cake with a piece for everyone, and a bottle of ‘champagne’ was smashed onto the front of the locomotive! One of several photstops. Photo Ed Beale. The train, consisting of Lxd2-476, Romanian coach, brake van and an empty transporter wagon departed at about 11:25. We had several photo stops and a longer stop at Bonin, and reached Manowo at 13:15, where there was an bonfire and people cooked sausages for lunch. Then at around 14:10 we continued the journey south to the current end of the line with just the locomotive and coach. This was an additional 2 km beyond Manowo. New life for old transporters. Photo Ed Beale. The TMKW are rebuilding a stretch of track which was stolen after PKP abandoned the line, with the goal of reaching Rosnowo. After another long stop, and coupling up three transporter wagons being used as p-way wagons to take back to Manowo, the train started back at around 15:10. At Manowo a fair amount of shunting was required to deposit the wagons we had brought from the end of the line and run round the train, which took about 25 minutes, then we continued into the gathering dusk, reaching Koszalin at 16:25. The end of the line. Photo Ed Beale. I had a chance to look into the sheds, where all the operational stock is securely stored. The group currently have Lxd2-476, Romanian railbus MBxd2-307, the Romanian coach and an open sided summer coach, the brake van and a p-way trolley. The shed area looks neat and tidy and I was very impressed with the amount of work that the TMKW must have put in to make it that way having taken over a derelict site only a few years ago. Motor Rail Simplex locomotives and Hudson hoppers on the Leighton Buzzard Railway, 1st October 2011. Photo Roger Marks. Some rights reserved. I have a spot for the Leighton Buzzard Light Railway every since I came across it by accident in 1967 during a cycle ride from Ealing to Leamington Spa. It was one of a handful of industrial narrow gauge lines which I had the pleasure of discovering when they were still working. Two were nominally ‘2ft’ gauge: The Pike Bros. Fayle and Co Tramway, in the Isle of Purbeck, was the first line I came across, the Leighton Buzzard was the second; two 2ft 3in lines serving the slate quarries at Braig Goch and Aberllefeni (at the head of the Corris Railway) followed in quick succession; and the last was the Sittingborne and Kemsley Light Railway, which I visited in its last full year of pre-preservation operation. The full story of the LBLR deserves to be explored in some depth on the pages of our sister website, EnglishRail, suffice it to say that the step-by-step development of – the railway, its support society, and the strong links between the Society and the local community – are all an excellent example of railway heritage ‘best practice’. Leighton Buzzard Railway coach 8, with PKP shield, 31st May 2009. This coach started life in 1958, as a standard-gauge 4-wheeled diesel railcar, built by Baguley for the Ministry of Defence, who used it on their extensive railway system at their depot in at Bicester, Oxfordshire. It was rebuilt an unpowered bogie passenger coach by Alan Keef Ltd, and mounted on ex PKP 600 mm gauge bogies. When and where it acquired its PKP steam locomotive Eagle badge is yet to be discovered! The two photographs that we used today are from the extensive collection of picture by Roger Marks hosted on flickr. Roger has photographed an eclectic choice of subjects. By generously making his photographs available under the Creative Commons Attribution-NonCommercial-NoDerivs (2.0) licence, he helps non-commercial users like BTWT and gets his work more widely known. Roger’s entire portfolio on flickr may be seen by clicking on this link: R~P~M. Please note all our own photographs (marked Photo BTWT) appearing in this blog may be used on exactly the same basis. Opatowek – Turek special train in 1995. Film AndrzejMastalerz. 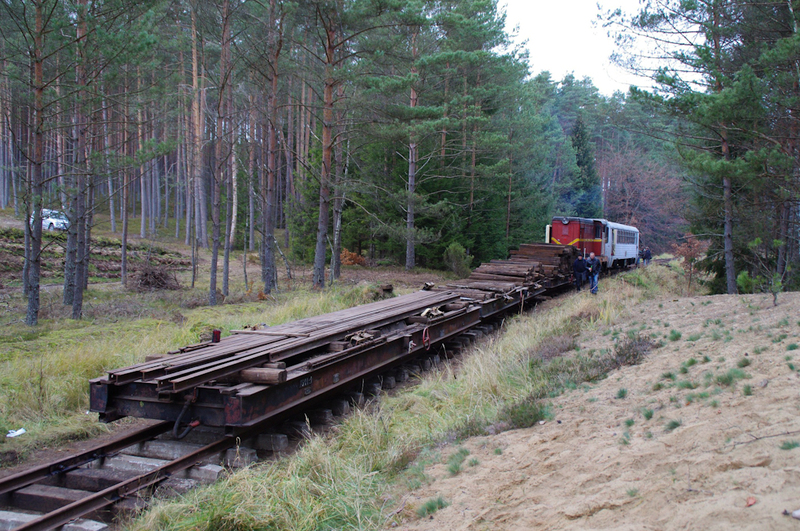 SKPL have published more details of their Kalisz Narrow Gauge Railway railtour which is due to run on 3rd December, Impreza Mikołajki z TOWOS-em. Departure will be from Kakisz (main line) station at 09:30. A vintage San H100 bus will first take passengers to inspect the site of the former narrow gauge passenger terminus, Kalisz Waskotorowy and then on to the SKPL Headquarters at Zbiersk Cukrownia. Here there will be an opportunity to look around the depot and photograph the extensive collection of narrow gauge freight vehicles. The special train to Opatowek will depart at 10:30. The train will be a mixed passenger/freight train hauled by an Lxd2 diesel. There will be two standard gauge Rs bogie bolster wagons (on narrow gauge transporter wagons) a Romanian DMU trailer coach and a brake van. At Opatowek participants will be able to photograph the standard gauge wagons being unloaded from their narrow gauge transporters. 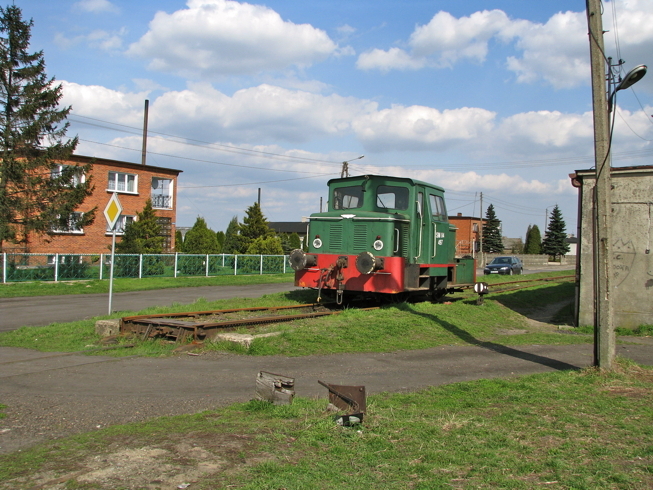 The Kalisz Narrow Gauge Railway. Map & map data courtesy Google Maps. The cost of the trip – including the vintage bus fare (one-way) from Kalisz to Zbiersk is 60 zloty. Participants who wish to make their own way to Zbiersk and forgo the bus will only be charged 50 zloty. Both fares include the cost of light refreshments. There are only 30 seats available on the bus and these must be reserved before hand. Return to Kalisz (not included in the cost) is by a normal service leaving Zbiersk at 17:20. BTWT regulars who wish to take the vintage bus option and who do not have a Polish bank account are asked to contact Dyspozytor urgently either by e-mail on railfan [at] go2 [dot] pl or via the BTWT comments facility. Special train at Opatowek on 16 April 2011. Photo BTWT. 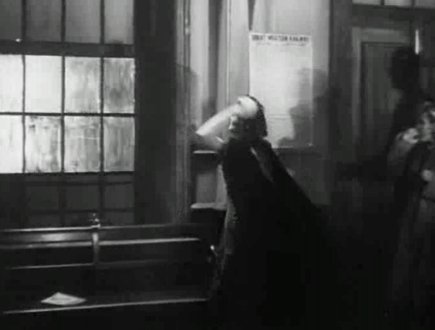 A passenger expresses her frustration at a unadvertised train running outside the published timetable. Still from The Ghost Train. A friend was coming up to see me from Warsaw to Lodz on Saturday (19 November) evening, and had an interesting journey. Here is his account. I had a busy day including a pupil whose lesson was due to end at 19:30. According to the official PKP timetable (rozklad-pkp.pl) run by TK Telekom and Dworzec Polski I had a choice of two trains to Lodz: the 19:50 Inter Regio due into Lodz Widzew at 21:21 and continuing on to Lodz Kaliska for 21:39; or the 21:33 Tanie Linie Kolejowe for Lodz Widzew only, arriving at 23:13. Lodz Kaliska being much more convenient for my final destination than Lodz Widzew, I phoned my pupil, brought her lesson forward and set out in good time for Warszawa Centralna. The reply to the timetable query. TK Telekom/Dworzec Polski. I got to the front of the queue at the ticket office at 19:40, bought my ticket for the 19:50 and then strolled off to find platform 4. Consternation, it is 19:50, but no 19:50 train to Lodz on the departure board! I rush upstairs to the monitors in the subway linking the platforms; no 19:50 train to Lodz; in fact, no 19:50 to anywhere! I charge upstairs to the departure hall and check out the new touch-screen information terminals. ‘Arrival times’, no I don’t want arrivals, ‘Departures’ that’s better, and there at last, is my train to Lodz Kaliska only it leaves at 20:10, not 19:50. Hey ho, if only I had known, I need not have rescheduled the lesson after all. We arrive at Lodz Widzew around 21:45, so far so good. Most people get off here. 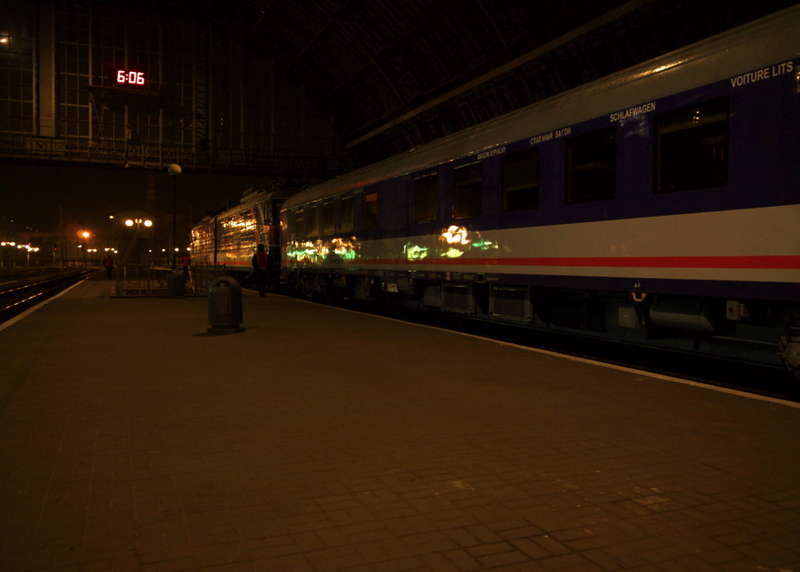 I ask the guard what time we are due in to Lodz Kaliska, he replied that we should be there about 22:35. I text this information to Dyspozytor our train pulls out and heads out North-east across the access tracks to the freight yard. Unfamiliar scenery follows is this really the route to Lodz Kaliska? We stop at another station; my remaining fellow passengers look worried. I look out the window; the phone rings. It’s Dyspozytor. According to my calculations, you are being routed via Zgierz. Please get out at Lodz Zabieniec. I’m not sure we stop at Lodz Zabieniec, I reply cautiously. All trains from Zgierz stop at Zabieniec, he says confidently. With half my body out the window. I can just make out the station sign which is situated conveniently at right angles to the platform. Where are you, he asks? I’m at Zgierz, but according to the route diagram that’s impossible. You’ve been routed via the freight cut-off line, he explains. Please get out at the next stop. After what seems an eternity, but is probably only 5 minutes, the train starts running back in the direction we have come from. We arrive at what appears to be a disused halt. It is 22:37. Should I really get off here? My phone rings. Please get out here. You’ve reached your destination. And that would be the end of the story, had it not been for the fact that I was not the only person waiting at Lodz Zabieniec to pick someone up. Obviously the fact that the 20:10 IR ex Centralna runs – and runs via Zgierz – is out in the public domain, if not in the TK Telekom timetable. I remember the little leaflets handed out to passengers on the last day of Lodz Fabryczna’s operation and the Notice to Passengers on the PKP IC website. I wonder? I check out the relevant BTWT post, follow the link to the PKP IC Notice to Passengers, and download the new timetable. Yes there it is – the 20:10 ex Centralna, calling at Widzew, Zgierz and Zabieniec! Commemoration of Poland’s Independence Day at the Tomb of the Unknown Soldier, 11 November 2005. Photo Daria2005. On 11th November Poland celebrates Independence Day, the day in 1918, when – after 123 years of having been wiped off the map of Europe – the country emerged like a phoenix from the ashes of WWII. That it did so owes a great deal to General Pilsudski. Those BTWT readers interested in discovering more about these remarkable events and their historical background are recommended to look up two works by Norman Davies, the best historian for those interested in an unbiased account of Poland’s past: the easy to read, Heart of Europe: The Past in Poland’s Present or the more technical twin volume work, God’s Playground, A History of Poland: Vol. 1: Origins to 1795 and God’s Playground, A History of Poland: Vol. II: 1795 to the Present: 1795 . Poland takes Independence Day very seriously; the commemoration was banned by the Nazis and Soviets during their WW II occupation of Poland and the subsequent Soviet-imposed communist government. The day is a bank holiday. As well as the main event at the Tomb of the Unknown Soldier in Warsaw countless parades and commemorative events take place all around the country. In recent years the Warsaw commemorations have been disturbed by a small number of violent activists who seem determined to spoil the event and Poland’s reputation abroad. This year a march was targeted by several bus loads of ‘rent-a-mob’ agitators from Germany. While the effect – perhaps deliberate – of such antics is that many Varsovians stay at home other commemorative events take place unimpeded all around the country. 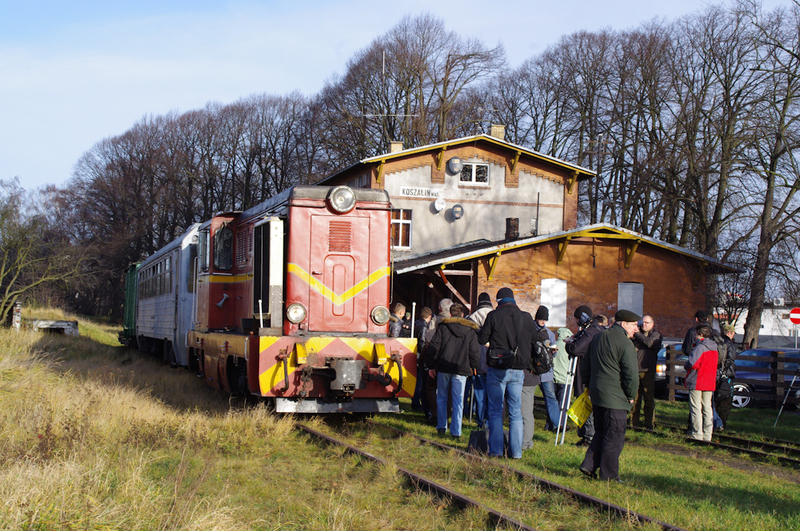 Several of Poland’s heritage railways run special trains on 11 November and this year was no exception. 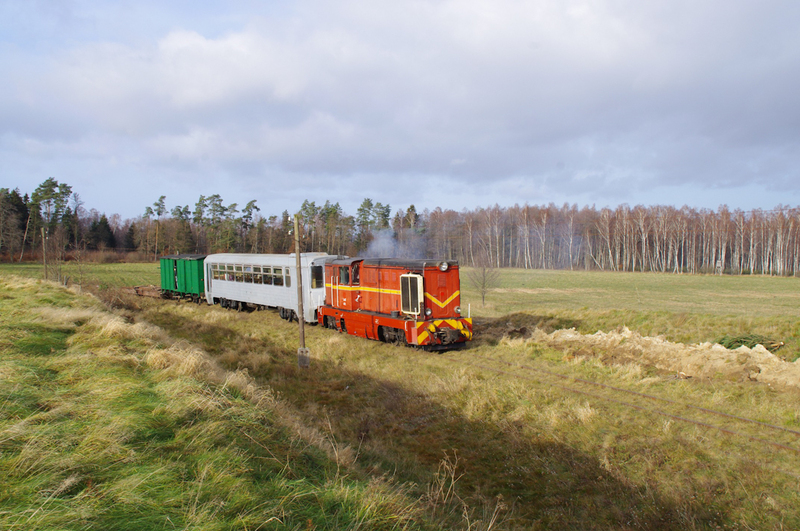 The Piaseczno Narrow Gauge Railway’s special train was heavily booked, but perhaps the biggest surprise was the reopening for two days – Friday 11 November and Saturday 12 November – of the Smigiel Railway. Two trains ran on each day from Smigiel to Stare Bojanowo under the auspices of the line’s new operator – the town council’s own direct labour force. Trains only ran as far as Stare Bojanowo Miasto, Smigiel Council having refused to make the payment – previously made by SKPL – to PKP which would have allowed trains to run the final 300 yards into the PKP station. This was the first time that a public train train ran from Smigiel to Stare Bojanowo since SKPL relinquished its role as operator of the line. Some 200 passengers were carried each day. Sadly none of our contributors were able to attend. However a very comprehensive photo report was published by on the naszemiasto.pl portal. A thumbnail of the article with a link to the original appears below. 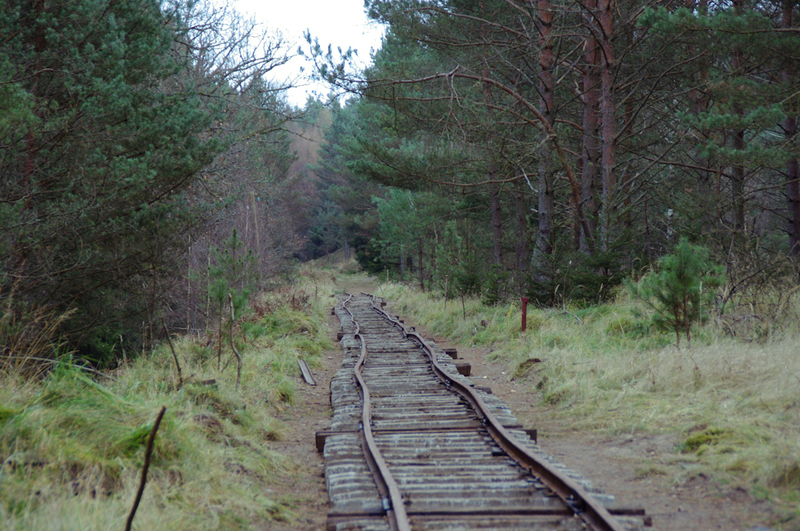 The Smigiel Railway now has its own official website. Mysteriously it does not feature any photographs of the reopening day, nor are there any photographs on the railway’s page on the council’s own website. 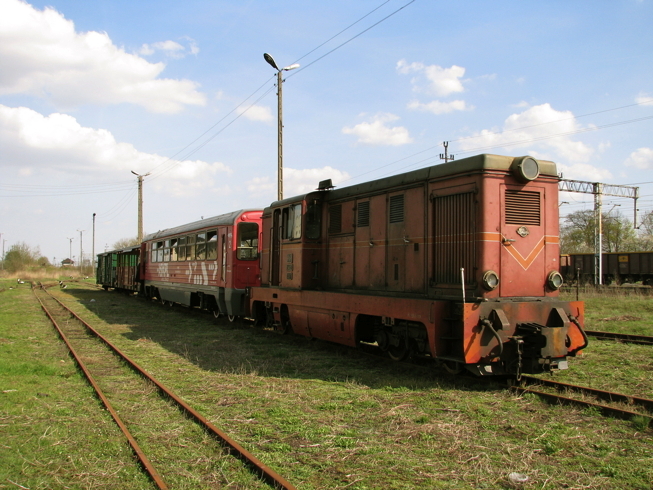 We have regularly asked BTWT readers to put pen to paper to appeal for the rescue of part of Poland’s railway heritage. Our readers have been generous in their response to our appeals. Perhaps now might be a good time to write to the Mayor of Smigiel to congratulate him on the reopening of the line. If you are considering dropping him a line, do take the opportunity to remind him that the restoration of the link to the PKP freight interchange is essential if he wants to acquire or borrow rolling stock from the outside world, and that cutting up the freight transporter wagons might turn out to be a very short-sited move. Slawomir Nowak. Still from election video. In his post-election cabinet reshuffle Poland’s Prime Minister, Donald Tusk, has chosen Slawomir Nowak to head up the Ministry of Transport, Construction and Maritime Affairs (formerly called the Ministry of Infrastructure). Because Poland holds the Presidency of the EU, the reshuffle had been postponed for a month so as not to disturb business with other EU members. Tusk’s new cabinet emphasises continuity in Poland’s international relations, and enhances the reputations of the Ministers responsible for Poland’s relations with the outside world. Oxford-educated, Radek Sikorski retains the Ministry of Foreign Affairs; and London School of Economics graduate, Jacek Rostocki, keeps control of the Finance Ministry. Other Ministers that retain their posts are: the Minister of Defence, Tomasz Siemioniak; the Minister of Economic Affairs, Waldemar Pawlak; the Minister of Regional Development, Elzbieta Bienkowska (the post includes responsibility for administering EU funds); the Minister of Agriculture, Marek Sawicki; the Minister of Higher Education, Barbara Kudrycka; and the Minister of Culture and National Heritage, Bogdan Zdrojewski (the person ultimately responsible for Poland’s railway heritage). Newcomers to their portfolios are: Michal Boni, Minister of Administration and Digitalisation (split off from the Ministry of Internal Affairs); Jaroslaw Gowin, Minister of Justice; Jacek Cichocki, Minister of Internal Affairs; Mikolaj Budzanowski, Treasury Minister; Marcin Korolec, Minister of Environment; Bartosz Arlukowicz, Minister of Health; Wladyslaw Kamysz-Kosiniak, Minister of Labour; Krystyna Szumilas, Minister of Education; Joanna Mucha, the Minister of Sport and Tourism (with ‘dotted line’ responsibility for Poland’s tourist railways); and Tomasz Arabski, Head of the Prime Minister’s Chancellery and Chairman of the Council of Ministers. Slawomir Nowak was born in Gdansk in 1974. He studied at the University of Gdansk and Gdynia Martime University. At the age of 20, while still a student, he started his own advertising business. He was also briefly the chairman of Radio Gdansk. He entered politics in 1993 as a member of the Liberal Democratic Congress which was led by Donald Tusk. Political consolidations and fractions led Nowak in turn to membership of the Democratic Union (UD), the Freedom Union (UW) and finally, in 2001, the Civic Platform (PO), the party that retains his affiliation to this day. Nowak has acquired a reputation as a go-getter. In 2004, he became a MEP. In 2007, he was elected a member of Poland’s lower legislative chamber, the Sejm, becoming at the same time a Secretary of State in the Chancellery and the head of the Prime Minister’s political cabinet. Between 2009 and 2010, he was head of the PO’s parliamentary party. In 2010, he became head of the PO’s Pomorze region and during the presidential elections, held later that year, he was head of the winning candidate’s, Bronislaw Komorski’s, campaign team. He was subsequently, appointed Secretary of State in the President’s Chancellery with responsibility for parliamentary and governmental relations, automatically loosing his parliamentary seat In the October 2011 elections, he was again elected to the Sejm. In his election video, Nowak cites infrastructure development as one of his three priorities as an MP. Unlike most of his parliamentary colleagues, as Minister of Transport, Construction and Maritime Affairs, he will actually be in a position where he can do something about his promise. 10¼ inch gauge Atlantic, probably built by Basset Lowke in 1937. Photo by Koscian.net. 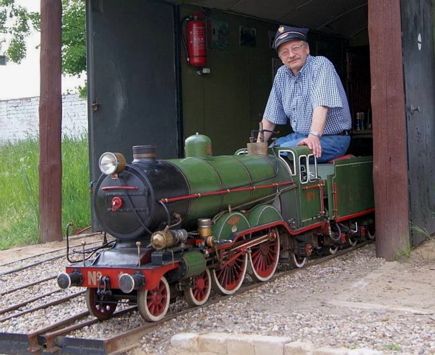 A row between Jacek Nowak, the new chief executive of the Krzywin municipality, and Roman Witkowski, the chairman of the Stowarzyszenie Hobbystow Kolejowych (SHK – Society of Railway Hobbyists) has lead to the closure of the miniature railway in Chichowo. For five years the miniature railway was the biggest tourist attraction in the village (pop. 94) and a key element in the tourist economy of the Krzywin municipality (pop. 9,892). The locomotive, whose pedigree is yet to be researched, was found hidden away in a barn and its restoration was a team effort between Roman Witkowski, who provided the funds, and Tadeusz Popiel who provided the engineering expertise. Once the engine was restored, the only problem that remained was to find a suitable site to run the engine. There were plans to build a miniature railway in Rudy Wielkie, and a park surrounding a country house in Rokosow was also investigated. But the best offer of all came from the then chief executive of Krzywin municipality who suggested a joint venture between the municipality and the Society. The municipality provided the land and the services of a full-time employee who combined the functions of security guard, track gang and train crew. The society provided the railway hardware and an army of volunteers. What, in fact, was to happen in Chickowo was the start a classic public-private-partnership. But with Polish law and legal ‘custom and practice’ yet to catch up with Poland’s post-communist economy, the agreement, struck in 2004, was verbal based on a handshake and a glass of vodka. 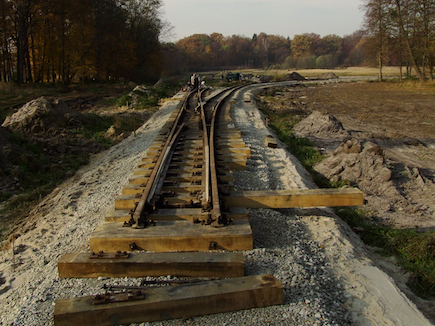 In 2005, the construction of the railway started in earnest, using track materials bought up by Witkowski from various saw mills and brickworks, and the labour of the municipality’s one-man track gang augmented by volunteers from all over Poland. By 2007, the railway was ready for its first summer season. Soon up to 3,000 passengers were using the line each year. The majority coming specially to the small village to travel on the line and see its Atlantic – the only British steam locomotive still working in Poland. So pleased was the former chief executive with the functioning of the railway and the contribution of SHK members that he made the life guard’s hut (the line runs near a large lake) available to provide accommodation for volunteers. 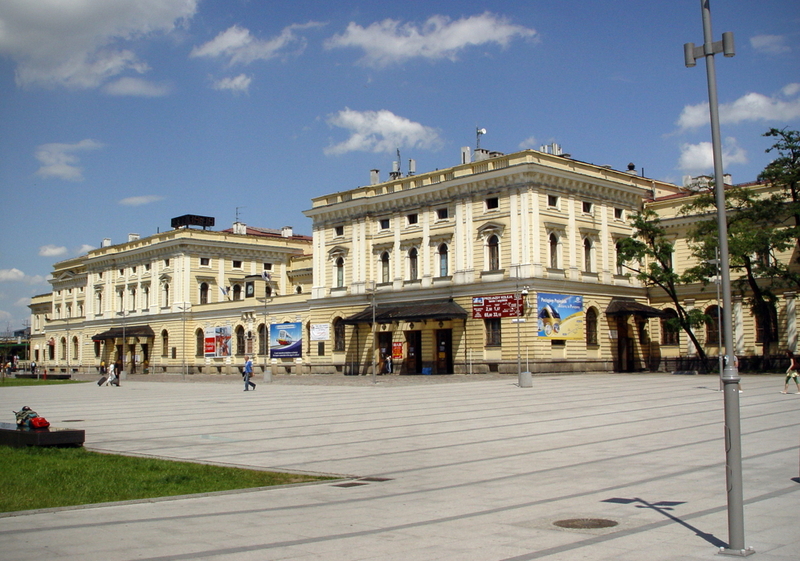 The Chief Executive’s office of Wielkopolska Province made a grant towards the cost of resurfacing the platforms and repairing the overall roof at the main station, while the Wielkopolska Tourist Organisation featured the line in its glossy brochure about the province’s railway attractions. Then disaster struck, in December 2010 Jacek Nowak took over as chief executive of Krzwin province and summoned Witkowski to his office demanding that the Society pay rent for the land upon which the railway runs and announcing that the termination of the funding of a council employee – by now semi-retired and working only half-time – and the arrangement whereby society members could stay in the life guard’s hut. In vain did Witkowski try to explain that neither the SHK nor the Chichowo railway was a commercial enterprise. In fact the railway ran at a considerable loss, but was enabled to run by the interest-free cash that Witkowski had invested at the start and the work carried out by volunteers without any remuneration. The contribution of the council – the land that the railway ran on and the wages of a part time member of staff – was returned to the local economy many times over by the visitors who came to see and ride on the ‘Lilliput’ line. The chief executive would not budge and demanded that the relations between the SHK and the municipal council be put on a strictly commercial footing. Witkowski countered by removing all his rolling stock and by starting to plan to relocate the railway elsewhere. Now the chief executive is claiming that the railway belongs to the municipality and is threatening legal action against Witkowsiki. With both sides seeing no alternative than a costly legal process to solve the ownership question, the story of the Chichowo miniature railway draws to its sad end. What is so tragic is that the short-sighted view of the chief executive is not unique to Krzywin, but has poisoned the well of so many Polish volunteer-assisted railway preservation schemes. Perhaps someone should point out to Jacek Nowak how lucky Chichowo was to have had such a tourist attraction. The story of the remarkable rebirth of the Ruislip Lido Railway – whose operating society are not charged by the local authority that owns their railway land – would make a good start. koscian.net – Finał w sądzie? 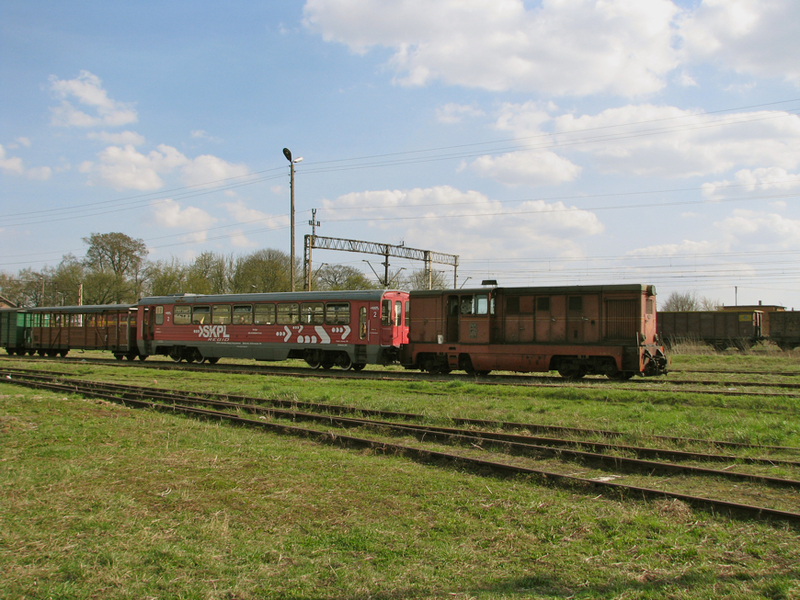 Lxd2-287 at the head of a Fedecrail study tour special train at Opatowek, 16 April 2011. Photo BTWT. There will be a rare opportunity to ride on the freight only Kalisz Narrow Gauge Railway on 3 December. The train will depart from Zbiersk around 10:00 hrs. The round trip Zbiersk – Opatowek – Zbiersk will cost 50 zloty. Kalisz Railway SM04-497 standard gauge shunting locomotive. Photo BTWT. At Opatowek tour participants will be able to see standard gauge wagons being unloaded from narrow gauge transporter cars. SKPL locomotives will be painted in the latest SKPL Cargo blue livery. We will publish further details just as soon as we receive them. Krakow Glowny – a broken station! 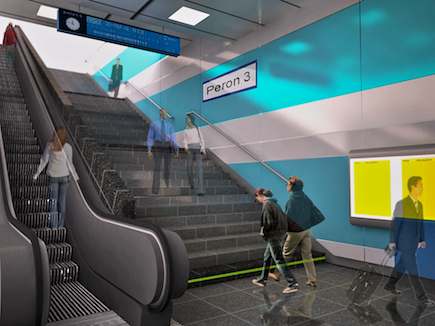 Access to the ‘deep level” subway, Architect’s visualisation PKP. I am very enthusiastic about Krakow and am prepared to forgive its many idiosyncrasies. The first time I went there under my own steam, I was directed to meet up with some friends one evening in the Inkwizytor Pub in ul. Kanonicza. Walking from one end of the short street to the other revealed no bar with this name, nor could any of the taxi drivers parked up near Wawel Castle help. Some time later, the secret was revealed. There is no welcoming pub sign. Instead you approach an elaborately carved stone archway, closed by an ancient oak door, the sort of portal that the art director of the Harry Potter films would have given his right eye for. You knock, give the right password and are admitted to the Department of Geology of the Jagiellonian University. You stride purposely forward into an enclosed inner courtyard, dive down some steep stone steps, pass through another oak door, and Bob’s your uncle! Since then, the Inkwizytor became one of my favourite haunts and I have lost count how many times I have enjoyed the hospitality of Krakow’s cellar bars or student-priced restaurants. Until recently my enthusiasm extended to Krakow Glowny railway station which, though a rambling affair with its main passenger facilities a long walk away from the platforms, was actually quite passenger friendly once one got to know one’s way around it. The station dates back to the 1840s. It was designed as a red-brick neo-Gothic affair with its own park by a Wroclaw architect, Peter Rosenbaum. During the next 20 years the railway infrastructure around Krakow expanded rapidly and the station facilities were soon inadequate. Between 1869 and 1871, the station endured the first of its many reconstructions. The main building was doubled in size, and given its present neo-Classical appearance, while the tracks and platforms acquired an overall glass roof. The Krakow Glowny station building. From a photo by Hubert Wagula. A further modernisation took place in 1892-1893, providing passengers for the first time with a subway linking the platforms. In 1920, when the track layout was changed. 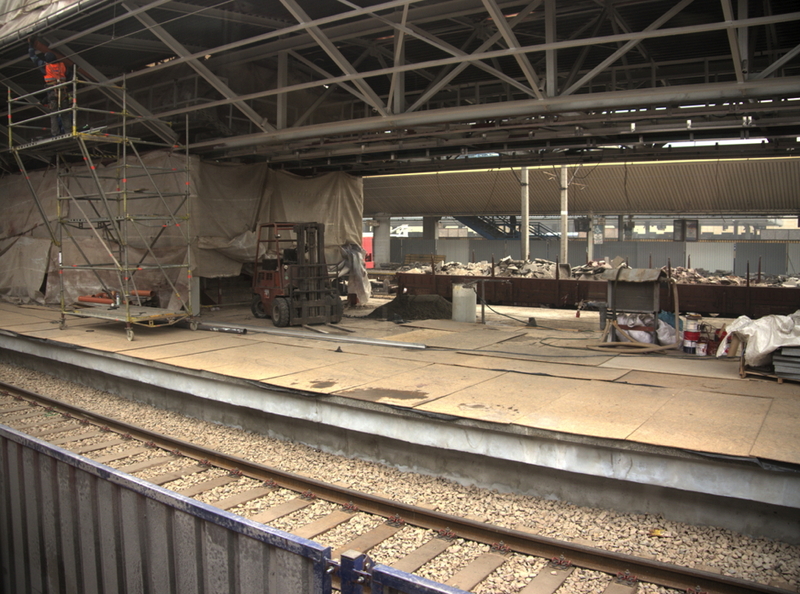 more platforms were added, the overall roof demolished and the station building was again extended. By 1934, the station was again bursting at the seams and an ambitious plan was devised to move the station and its passengers facilities some 300 yards to the North, where the station throat provided generous space for expansion. WWII brought these plans to a halt: the General Government – the Nazi name for the authorities running that section of Poland that was to be incorporated into Germany – planned to eliminate the cross-town line and build a new station elsewhere; after WWII, the communist authorities toyed with a similar scheme. Finally in the 1970s, PKP dusted down the original pre-war blueprints and drew up new plans for a station to the North of its previous position in an area where there was room for more through platforms. There were to be 5 levels, with many facilities buried deep underground – like the present plans for Lodz Fabryczna – the project reflected PKP’s predilection for hiding its stations and its passengers. The design envisaged a car park on the roof, which spanned the tracks and platforms. Below the tracks were to be two subways linking the platforms, below these the main concourse area and station facilities, and below these a possible metro station. Substantial progress was made and the major civil engineering work was completed. But then, as in the ill-starred rebuilding of Lodz Kaliska, the money ran out. Danger men at work. Photo (taken through a train window) BTWT. What was built worked quite well. So that any future construction work – such as the proposed metro – caused as little disturbance as possible, the new station was built on top of an elaborate concrete framework. Train diagrammers and signalmen have standing orders to route all freight trains to by-pass the station to extend the working life of this construction. The car park, new platforms and two new subways were commissioned. But the only facilities provided on the main concourse level were the toilets. The rest of the empty concrete caverns were sealed off with heavy steel shuttering. All other facilities: booking hall, train indicator boards, left luggage, refreshments and station offices were retained in the 19th century station buildings which were connected to the new station by a covered walkway. The roof over the walkway was made of recycled parts from the original platform awnings blending perfectly with the old station buildings. Some of the same material was also used to construct a period station platform in the Skansen at Chabowka. For nearly 30 years the hybrid station, blending a 19th century station building with 20th century platforms and car parking facilities, worked quite well. Cars, buses and taxis could draw up to the very front of the station building. Here you could check your train times, buy a your ticket, have a quick snack or a more elaborate meal, and buy a newspaper or magazine. The covered walkway led to two shallow subways. One was could be reached by a short flight of steps, the other buy a gentle slope. The latter was ideal for people encumbered with heavy luggage, particularly as lifts were available to connect with the platforms above. The rot set in when the Galeria Krakowska – a huge shopping centre – was built during 2004 – 2006 on former railway land next to the station. The city authorities wanted a piazza next to the historic buildings, so the car pick up/set down, taxis and buses had to go elsewhere. The new piazza outside the station. Satellite photo courtesy Google Maps. A bus station was built to the East of the ‘new station’, an official car pick up point was established on the station roof, while an unofficial one jammed up the end of ul. Topolowa. These facilities fed in some passengers directly to the new station at the East end of the South subway, so a train indicator board and ticket facilities were provided, so obviating the need for these passengers entering the station here to walk to – and return from – the main station building. Everything still worked reasonably well, provided you knew where to find it. However faced with competition from 22 different outlets offering food of in the Galeria, the buffet style restaurant in the main station building – never particularly salubrious – went into terminal decline. Although the Galeria, like part of Zlote Tarasy in Warsaw, was built on railway land ńo effort was made to tidy up and utilise the empty concrete caverns under the tracks. PKP’s Estates Department seems never to have heard of a development premium, whereby the developer carries out some works for the benefit of the general outside the immediate footprint of the development. A new deep level passenger subway was constructed under the railway tracks at the same level as – and connecting directly with – the lowest level of Galeria, but lifts or escalators to platform level were conspicuous by their absence. Part of the huge space under the tracks was utilised for a road tunnel connecting ul. Wita Stosza with ul. Pawia and finally the deepest level was exploited at last when the 1970s designed metro tunnels were used for an extension of Krakow’s ‘fast tram’ network. Then flushed with football fever, PKP decided that it would build an integrated ‘transport hub’ at Krakow Glowny in time for the Euro 2012 championships. Chaos reigned. Lifts were switched off. Access for people with mobility problems – or bad backs – became non-existent. Contractors complained that they were being given contradictory instructions by PKP PLK, who were responsible for the tracks, and PKP SA, who were responsible for the real estate. About the only statement that can be made in absolute confidence is that it seems increasingly unlikely that the whole caboodle will be ready when the first kick off takes place on 8 June 2012. There was a ‘cloth fair’ in the central square since the 13th century. It took 300 years for the building to acquire its present shape. Will the rebuilding of Grakow Glowny take as long? Photo BTWT. So with a tram to catch close to the old station building, lifts not working and the ramp leading to one of the old subways out of action, I was not a happy bunny. Carting heavy luggage up and down stairs is not recommended when suffering from a back injury. I cheered up a bit when I discovered that the left luggage facility inside the old station building was still working and the the attendant was prepared to take 3 pieces of luggage and only charge me for two. A short walk took me to the tram stop and almost instantly a No.4 tram turned up to take me to my stop at Teatr Bagatela. A short walk and I was at my destination, Dynia, a highly regarded, inexpensive, eatery popular with students. Did the Gods smile at me for what was left of the day? Well no. Catering in Poland has improved by light years since the old days, and it seems like an eternity ago that I had to teach a Krakow café how to make a latte macchiato. So when it was time to order the sweet I did not anticipate too many problems. Do you serve sharlotka (apple strudel)? I asked. Yes we do, the waitress replied with a smile. Well could I have a hot sharlotka with a single ball of vanilla ice cream on top? The waitress looked horrified, But it will melt! But that’s just how I like it. I’ll go and ask, and she scampered away. You can have the sharlotka on one plate and the ice cream on another, but not both together. At this point I usually let my missionary zeal get the better of me and explain firmly that we have left the dark days of communism far behind and that it is customers like me who are keeping her restaurant open and paying her wages. But this time, in deference to my companion, whom I had not seen for ages, I kept mum and just said that in that case I would not bother with the sharlotka and would chose something else instead. When the meal had finished I decided to revisit the old Inkwisytor. I know that the set that used to drink here has moved on, but does the bar still exist? A sign on the outside – there never used to be any sign – proclaimed Autorska Cawiarnia (Authors’ Café) – I feared the worst! A brand new narrow gauge railway in Poland! This is Alice in Wonderland story seems almost too good to be true. But as these photos – sent to us by a BTWT reader – show, the new railway is actually taking shape. Although, like the adventures of Alice, the actual story has a bitter twist. The new junction takes shape. The municipality of Krosnice (not to be confused with the town of Krosniewice!) is building a 3.2 km park railway around a sports and recreational complex which it is developing with the help of EU Regional Development funds. 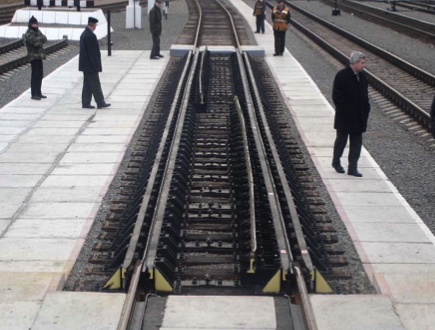 The total project is to cost about 6.6 m PLN and involves the digging of several lakes as well as building the railway. The budget is as follows: building several lakes – 1.26M PLN, building the narrow gauge railway – 3M PLN, track materials – 0.8M PLN, fitting out 6 halts – 0.2M PLN, purchase of rolling stock – 1M PLN, purchase of steam locomotive 0.6M PLN. But the project is but a faint echo of a much grander project which fell by the wayside. When the potential of EU-funded tourist development projects was first realised several ambitious Welsh Highland style railway restoration projects were pencilled in for Dolny Slask province. One of these was the rebuilding of the rack railway in the owl mountains. 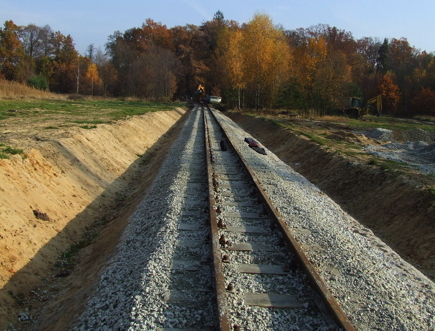 Another – which made a great deal of progress in the early stages – was a partnership by three local authorities to restore a section of the Wroclaw narrow gauge railway between Pracze – Milicz Wask. – Bracław. The section of the Wroclaw Narrow Gauge Railway which was to have been restored. Map courtesy Google maps (maps.google.com). 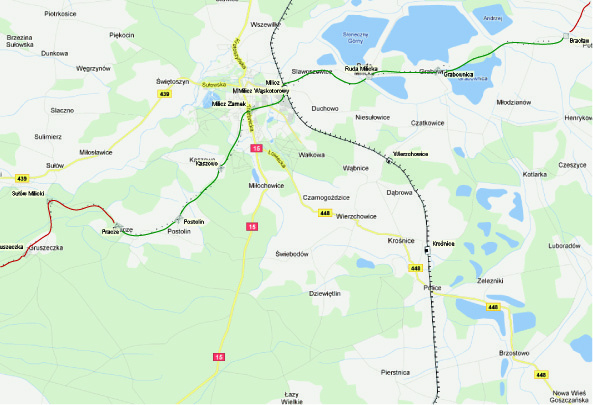 Railway mapping courtesy Railmap (mapa.kolej.one.pl). Lodz Widzew on 7.11.2011. According to the sign access to platform 2 is either via subway or footbridge, but there is no subway, and the footbridge is closed, Photo BTWT. I very nearly missed my train to Krakow, the 09:06 from Lodz Widzew. In hindsight it would have been better if I had. Lodz Widzew is a mess. (See Mike Dembinski’s post on Ww-a Jeziorki.) It is definitely not a place to drive into, tyres screaming, 2 minutes before booked departure time and expect to get into the right train. I had a choice of two. There was a train that looked right for the Krakow run, a nice EU07 electric locomotive and a traditional rake of compartment coaches; there was also a train that looked all wrong, an ED74 electric multiple unit. I hate the ED74s as I hate no other vehicle. Originally ordered for the Lodz – Warsaw run, they generated so many complaints that PKP IC were forced to swap back most of the Lodz – Warsaw services to loco-hauled trains and disperse the displaced ED74s around the network. But the driver of the ED74 was sitting in the right driving compartment for a run to Krakow, while the EU07 was on the wrong end of its train. So after a long delay (and a very patient guard) while the dreadful truth dawned, I boarded the ED74. What’s wrong with the ED74s – everything! Designed by PESA of Bydgoszcz, a company better known for its trams rather than its trains, they would make ideal stock for outer suburban services if not for their incredibly uncomfortable seats. Nobody can sit up straight in the seats for long; their profile, surely designed by someone with shares in Polski Bus, will damage the toughest back. Passengers contort themselves into different positions to ease the pain, but there is no escape. After the 2 hour run from Lodz to Krakow, one’s back is out of joint for a week. The Lodz railway network. From a larger map prepared by PKP Polskie Linie Kolejowe S.A., http://www.plk-sa.pl. With increasing numbers of ED74s in service since 2007, a survival strategy was needed. I started to manage my rail journeys so as to travel on the locomotive-hauled long distance services that ran via Lodz Kaliska; I travelled during the rush-hour when, after a short hiatus, the inadequate 8 coach twin ED74 sets were switched back to 11 coach loco-hauled trains. If, in spite of all my precautions, I did find myself on an ED74 I sat on the folding seats near the 2nd-class toilets which were marginally more comfortable than the standard seats elsewhere. 5½ hours on an ED74 folding seat is no joke. The journey was punctuated by informing people that the toilet was out of order, but they would find another in the first class compartment at the head of the unit. It was not long before the first class toilet waste tank was full as well! Then a moment of panic; surely that ornamental park is just before Skierniewice? Skierniewice; why are we stopping at Skierniewice? 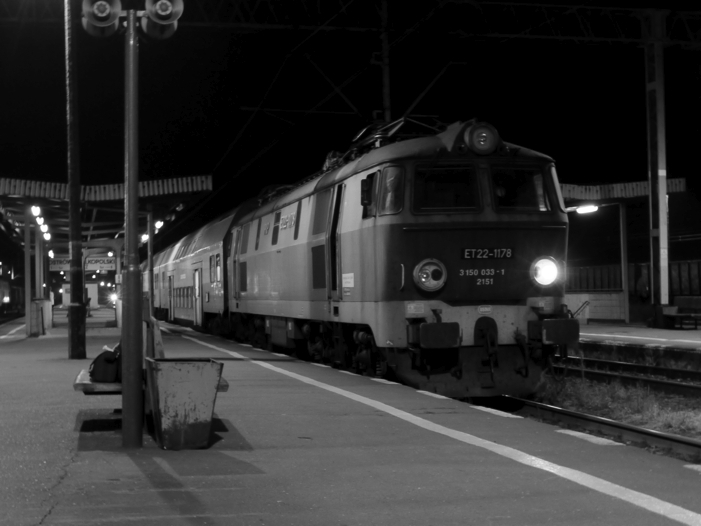 Lodz – Krakow trains do not go via Skierniewice! Had I, after all, boarded the wrong train? Was it bound for Warsaw rather than Krakow? Just after the Skierniewice PW depot we branched off heading generally to the west leaving the mainline heading south-west-by-west. (See map.) That was marginally better, between Koluszki and Skierniewice the train had actually been running in the opposite direction from Krakow; now at least, even if it was not getting any nearer, at least it was not getting any further away. But now where? 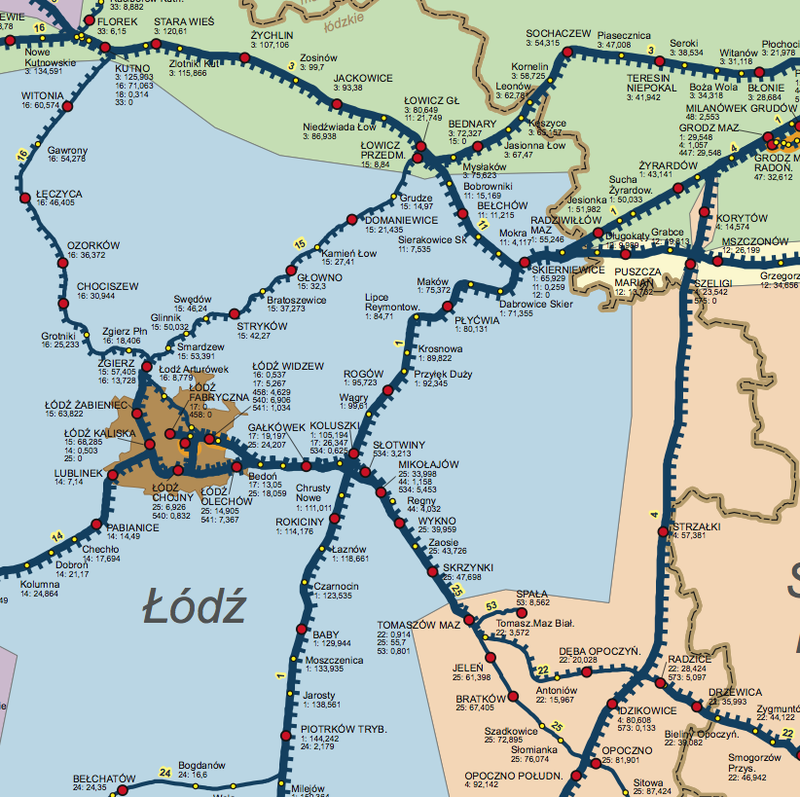 There is no West-to-South curve between Grabce and Szeligi; could the train be heading for the legendary Czachowek and the old main line to Krakow via Radom? Another unscheduled stop, this time at Mszczonow. The driver walks through to the back of the train and tries the toilet door. I’m sorry it’s out of action, I hear myself say. Perhaps the toilet in the first class section is still working? The driver heads off the way he came. After a long wait the he reappears, the train reverses direction and takes the East-to-South curve down to the CMK. A little research subsequently reveals that the train was originally diagrammed to run from Koluszki via the Tomaszow Mazowiecki – Radom line and to turn South onto the CMK at Zapowiedz, but with the section between Tomaszow and Deba Opoczynska out of action for track repairs, instead of re-routing the train the obvious way – via Piotrkow Trybunalski and Czestochowa – PKP Polskie Linie Kolejowe – had sent us on a magical mystery tour. Krakow market square and Cathedral. Photo BTWT. I did get to Krakow eventually, as the photograph of the market square proves, but by then my back was seriously out of kilter and was to go downhill badly during the next few days. A sudden summons to Lviv, to celebrate the 150th anniversary of railways in the Ukraine, caused a fluster in the BTWT tower. It’s only a short hop by bus, suggested one wag. It may be a only be a short hop, but it’s a bus too far, I replied. My bad back does not permit me to undertake long journeys sitting in a bus. I suffered a back injury in the Gare du Nord in Paris on 12 December 1981 after carrying some very heavy luggage for a very pretty Polish girl hurrying to catch her train to return home to Poland after the expiry of her visitors’ visa. She caught her train, but only just, and I damaged a disk, which was to rupture a few weeks later and leave me bed-ridden for 6 months and in pain for many months thereafter. If only I had not been so keen to help, she would have missed her train, but I would not have smashed up my back. The following day, General Jaruzelski declared martial law in Poland and the French authorities immediately granted visa extensions to all Poles who were in the country when Martial law was declared. Had the girl missed her train, she could have stayed and worked in France for as long as she would have liked. There is an excellent night train sleeper service from Krakow to Lviv, and Krakow is only a short hop by train from Lodz, so I treated the bus suggestion with the scorn it deserved and proceeded to surf the Internet to find my trains to and from Lviv. The PKP InterCity website is a total waste of time. The e-ticket booking facility does not work for international trains and the website has no information for travellers to the Ukraine which is of any value whatsoever. I moved on to the regular PKP electronic train-finder and timetable at rozklad-pkp.pl. Confusingly this does not allow one to enter “Lviv” as a valid destination, but does allow the Polish and Russian equivalents – “Lwow” and “Lvov”. Finding the night sleeper from Krakow to Lviv was easy; finding the return train was more difficult; according to the time table the night sleeper from Lviv to Krakow did not appear to exist. A personal visit to the PKP IC advance ticket counter at Lodz Kaliska was called for. And what trains would you like to travel on my dear? I’m awfully sorry the train I want to travel on does not appear to exist! The lady booking clerk was a model of efficiency. Don’t worry I’ll ring a colleague in Warsaw. I started to thank her profusely. Don’t thank me just yet, she laughingly replied. Her Warsaw colleague came up with a secret code; my model booking clerk entered it into her terminal and lo and behold the 00:59 from Lviv to Krakow magically appeared, my ticket and sleeping berth reservation followed shortly after. I flirted wildly with the booking clerk, If only the rest of PKP InterCity was as efficient as you are madam everybody would want to travel by train. Unfortunately the bosses of InterCity prefer travel by car and plane and have no idea what is happening on the railway. Super power on short haul PR working. Heavy freight Co’Co’ ET22-1178 with two car double deck set at Ostrow Mazowiecki on 26.8.2011. Photo BTWT. Poland’s local services operator, Przewozy Regionalne (PR), must be split up into a number of smaller companies – this was the majority view at a meeting of all the CEOs of Poland’s provinces during a discussion that took place on Thurday 28 October. The CEOs feel that the current set up whereby PR currently is owned by 16 provincial governments, gives them little effective say in how PR is run. Splitting up PR is not exactly a new idea. In 2005, when PR was still part of the PKP Group a study group led by Jan Rokita the then chairman of Poland’s ruling party, Platforma Obywatelska (Civic Platform), proposed splitting the company into 5. Subsequently, Adam Struzik, the Chief Executive of Mazowsze province, suggested that a three way split would create companies that would be small enough to manage effectively, yet large enough to generate economies of scale and operate on well-defined traffic corridors. Recently, the 16 local authority owners have formed 4 ad hoc syndicates for the purpose of EU-assisted rolling stock purchases. Progress was achieved – it is much easier for 4 or 5 people to agree than 16 – and the experience added new impetus to the proposed split. On 31 October, Poland’s rail minister, Andrzej Massel, in an interview with Rzeczpospolita expressed himself in favour of a split. It looks as if the train is rolling.